New patterns, new signings, I promise this won't turn into blog o' ads, but there's what's happening Chez Alpaca Addict. This pattern is called Cushy. 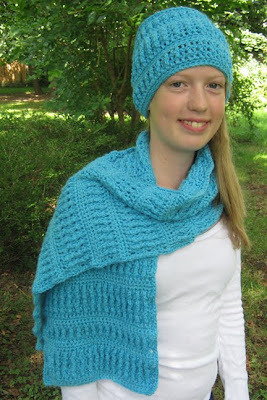 It's a slightly slouchy hat and wide, dense scarf, made in a pattern of front post and back post treble crochets. The yarn is new from Rozetti and is called Spark - it's a worsted weight with - it's hard to describe but I love it - it has some shiny stuff in it that gives it a textural look, but it's not too glittery for my taste. Mouse over any of the colors in the link for a close up to see what I mean. Dense visual interest in the yarn, dense crochet stitch pattern = good looking and warm! Next we have the Mutable Wrap! 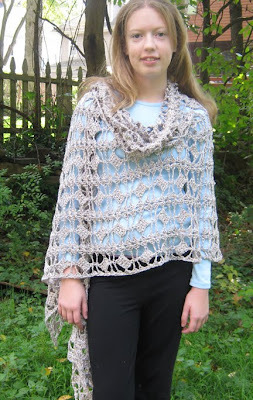 Shown in Universal Yarn Linen Tweed this oversized lacy crocheted shawl has two slit in the work - you can wear it as a vest, a wrap (as shown) or a poncho/capelet (which LL wants you to know was her idea, she came up with it during the photo shoot!) More photos on the pattern listing. Going to Rhinebeck? Please come see me Sunday from 10 - 4 at the author area in building B - where the Gem and Mineral Show used to be. Then at Stitches East, I will be signing books on Saturday and Sunday from 11:30 - 1:30 with my good buddy Marci at The Elegant Ewe. Marci will also have Hooked for Life patterns for sale, and models to paw. Yarn just arrived for a big magazine project that's due soon - I am off to search Hulu for great tv shows and to crochet my face off. See you all soon!